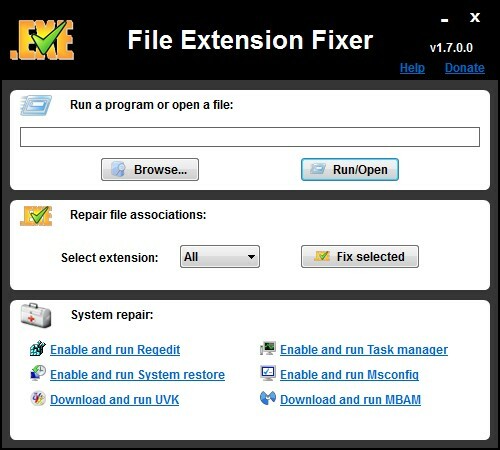 File extension fixer is a free tool intended to fix executable file associations and run programs even when those extensions are damaged. It also includes several fixes to common issues caused by modern malware to windows registry. Version .com available to be used if the .exe file association has been corrupted. Supported file extensions are: EXE, MSI, REG, BAT, CMD, COM and VBS. File extension fixer is free software, currently only supported by donations. Once you have successfully launched File extension fixer, you will be able to run executable files even before repairing the file associations. Just enter the command you want to run in the text input box, or press the Browse button to locate the file using the Windows Shell. The input box also supports Drag and Drop. Just drag the file you want to open/run to the text box, and its full path will be automatically inserted. When ready, press the Run/Open button to open your file. This feature can also be used to access internet locations, or download files. Just enter or paste the url you want to open to the text box and pres Enter or the Run/Open button. For instance, to open this page, enter http://www.carifred.com/exefixer/ in the text box and hit Enter. To download UVK, enter http://www.carifred.com/uvk/UVKSetup.exe in the text box and hit Enter. 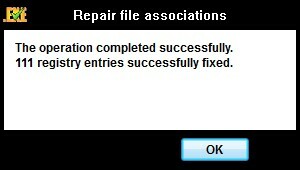 To repair corrupted file associations, select the extension you wish to repair in the combo box. Supported extensions are: EXE, MSI, REG, BAT, CMD, COM and VBS. If you want to repair all seven file extensions, select All. Sometimes malware use the group policy to disable some system tools that could help you to remove the infection. The tools that are usually disabled are the registry editor, the task manager, the system restore, the System configuration utility (msconfig) and the command prompt. Press the text link corresponding to the tool you want to enable and run. For instance, you may want to enable and run the system restore, and restore your system to a state before the infection. The last two options allow you to download and run two well known tools that will help you to take care of the infection: Ultra virus killer and Malwarebytes Anti Malware (MBAM). If the .exe file extension is corrupted, download File extension fixer.com. 1: Right-click a file that has an "Open with" context menu (eg: a text or word document or a picture), hover Open with... and click Choose default program. 2: Uncheck the box that says to always open this file type with this program. 3: Click the Browse button, browse to the path where File extension fixer is located and click to select it. 4: Click the Open button. If you're working on Windows Vista or higher, and the User account control is enabled, these steps won't work in normal mode if the key HKEY_CLASSES_ROOT\exefile has been completely deleted, because windows won't be able to set the administrator rights for ExeFixer. Thus, if you didn't manage to run File extension fixer using the steps above, reboot into safe mode and repeat the procedure. While you're working in safe mode, it may be useful to disable the User account control, especially if the computer is still infected, because the malware will certainly delete the .exe extension again once you reboot in normal mode. You can also press the Enable and run Regedit button, search for the value EnableLUA under the HKEY_LOCAL_MACHINE\SOFTWARE\Microsoft \Windows\CurrentVersion\Policies\System key and change its data to 0. Now you shouldl be able to run File extension fixer in normal mode.